Not even 10 days have passed after the launch of the much-awaited City Bus Service and complaints of overcharging by staff have started pouring in with the Ludhiana Municipal Corporation (LMC). This fact came to light when this reporter travelled on a route and spoke to some passengers, who complained that they were being overcharged and sometimes handed over hand-written tickets, which did not mention the ticket charges or any other details. People who boarded a bus from near Jalandhar Bypass and got off in Clock Tower complained that they were charged Rs 10 instead of the fixed amount of Rs 5. The Tribune is in possession of one such ticket, on which the conductor had written Rs 10 with a pen. Ironically, this amount is being charged from the residents blatantly as on the same ticket, Rs 5 and route is clearly mentioned. As per the rates fixed by the LMC, for a travel of less than 5 km, ticket charges are Rs 5, for travelling 5-10 kilometers, charges are Rs 10, while for travelling more than 10 km, one would have to pay Rs 15. But the present Bus Stand-Jalandhar Byepass route is of 6.6 km (see box) and when one boards a bus from Jalandhar Bypass till Clock Tower, the total distance is 2.7 km. So as per the rates fixed by the MC, the fare is Rs 5, but residents are charged Rs 10, which is totally wrong. When contacted, MC Commissioner Malwinder Singh Jaggi said that it’s a serious issue and needed be to looked into with immediate effect. “Now that you have brought this to our notice, I have ordered that flying squads should be formed, which would keep a check on this issue. And if any person is found overcharging, his services would be terminated with immediate effect. I would not tolerate any such nuisance,” claimed Jaggi. Keeping in view the Vidhan Sabha elections which are going to take place on January 30, Additional Deputy Commissioner Rupanjali Kartik today banned the carrying of arms and weapons by their owners. The ADC issued these orders under under Section 144 of the CrPC. The ADC said the orders would not be for paramilitary forces, army personnel and police employees in uniform. People who have the right to keep arms and weapons due to religious or legal reasons will not be covered under this ban. This ban will remain in force till February 22. Meanwhile, Commissioner of Police, Ludhiana Dr SS Chauhan, also held a meeting today with SHOs, ACPS and Additional Deputy Commissioner of Police and asked them to keep a tab on anti-social elements in their respective areas. He also asked them to control the crime and put an extra vigil on the anti-social elements. Though the much-awaited burns unit at Lord Mahavira Civil Hospital is ready, neither any staff been employed nor any apparatus purchased. The construction of this mega unit started a year ago, but the contractor left the project midway. The health authorities called for fresh tenders and assigned the work to another contractor. About Rs 2.5 crore has been spent on the construction of 40-bedded burns unit. The large-scale sale of plastic strings for kite-flying here is posing a threat not only to residents but also to birds. The sale of plastic string at Rs 800 per kg by kite vendors all over the city gives scant regard to the fact that in order to earn quick bucks they are playing with precious human lives. Unfortunately, there is no law which can restrain them from doing so, said Vipan Bhatia, founder president, Pakshi Seva Samati, near bus-stand. According to a kite-trader, plastic strings worth Rs 2 crore have been sold across the state so far. The plastic thread has taken over the conventional cotton thread and the sale is catching up amongst the youngsters, as this thread is considered far stronger than the conventional cotton thread, which is disposable as well. On the other hand, the plastic thread is not disposable. Youngsters are busy purchasing this thread, paying scant regard to the fact that the thread they are purchasing can kill birds. Already deaths of pigeons have been reported from various part of the city. The thread, known as “Chinese Dor”, is laced with razor-sharp glass powder, enough to cause harm to human life also. Last year, two residents of Kadwai Nagar injured their hands while flying kites with plastic thread. In November, a boy got electrocuted after coming in contact with overhead high-tension wires. Later, it was found out that the boy was flying kite with a Chinese string. As the plastic string is strong, it did not detach. The boy came in contact with a high-tension wire and got electrocuted. Last year, these threads were the major reason behind power failure. The electricity department employees said the thread gets entangled around high-tension power cables and lead to power snapping in various part of the city. Dr Sandeep K Jain, a wildlife warden, is spearheading a campaign against the sale of plastic string which results in the killing of 40 per cent of the bird population in the industrial town during the month of January every year. He has appealed to residents to avoid flying kites, as this kills and causes lifelong injuries to birds in many cases. "The plastic thread is proving to be a threat and even fatal to thousands of birds every year. Ludhiana is a place with the highest number of kites flown during the months of December and January, which results in the reduction of bird population," said Jain. Vipan Bhatia, founder president, Pakshi Seva Samati, near bus-stand has requested the resident to bring the injured birds to their bird care centre. The residents can also contact on their Helpline No. 98882 22973. They stood like stately grandparents of the automobiles capturing their grandeur of the times, during the vintage car show organised at the Pakhowal Road by the Punjab Heritage Motoring Club. 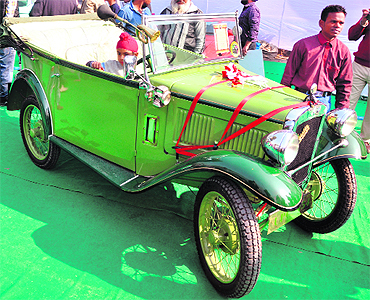 Around 21 models of cars and two-wheelers were part of the show. The oldest one was the open-top 1929 Austin of England the blow-horn, lamp and spoke-wheel car, which completely differs from the modern cars in shape. The show also included a fleet of Beatles from 60’s and 70’s in different colours. “This is a legendary design and one of the most celebrated,” said the owner of one of the cars. Around 15 bikes and scooters stood almost capturing the story of evolution of the two-wheeler from the old Rajdoot to Lamretta and Vespa. A Lamretta with buggies attracted numerous onlookers. Speaking about his passion for these vintage vehicles Avtar Singh said he loves restoring old vehicles. “You can buy the top-most models of the finest of cars today, if you have money. But these old are now rare and priceless,” he said. Yudhveer Virk, a software engineer, also loves the Zango he customized himself. It is not for the first time that both Akali leaders Hira Singh Gabria and Simarjit Singh Bains have been at loggerheads. During the last Municipal elections in 2007, Bains had fielded eight independent candidates against the official Akali candidates, which were selected by Gabria, and the independents managed to win these seats. Later all these independent councillors officially joined the SAD in the presence of Sukhbir Singh Badal, who at that time was its acting president, at a function organised in Guru Nanak Bhawan, here on August 26, 2007. Ever since relations between Gabria and Simarjit Singh Bains started deteriorating, both leaders have been criticizing each other on public platforms, sometimes even in the presence of senior party leaders. Even during the election of city Mayor, Simarjit was one of the contenders and claimed to have support of 22 Akali councillors. But due to the intervention of Chief Minister Parkash Singh Badal, Hakam Singh Giaspura was made the city mayor. But all these years, Simarjit Singh Bains has been vocal against both Cabinet Minister Hira Singh Gabria and Mayor Hakam Singh Giaspura, often accusing them of being corrupt and looting the residents. In the recently held Shiromani Gurudwara Parbandhak Committee elections, Gabria had openly supported independent candidate Surinder Singh Ryait, who was contesting from Ludhiana (South) constituency against Simarjit’s elder brother Balwinder Singh Bains. However, Balwinder won this election with a comfortable margin and ever since Simarjit had started announcing in public meetings that he would contest the upcoming assembly elections against Gabria. “If the party did not take any action against Gabria and Mayor after all that happened in the SGPC elections, then I have every right to oppose them,” Bains said during a press conference today. But a few weeks ago, one of Simarjit’s trusted lieutenants, councillor Jagbir Singh Sokhi, switched sides and joined the Gabria camp. But Simarjit still claims to have the support of several councillors. Now that Hira Singh Gabria is official Shiromani Akali Dal (Badal) candidate from newly carved out Atam Nagar constituency, Bains has decided to contest against him as an independent candidate. The interlocking tiles fixed at the Bagh Kheta Ram locality situated on the Sherpur Road have started dislocating from various places within a month thus putting a question mark on the quality of the material used by the contractor for affixing these tiles. According to residents of the locality, these interlocking tiles, which were fixed 25 days ago, have started dislocating from various places. The residents rued that though they had made municipal council president Baldev Krishan Dhir aware of substandard material used by the contractor, no action has been taken against the contractor in this regard. “The interlocking tiles were fixed in our locality about 25 days ago. When the work of fixing tiles was going on, we had informed the MC president about substandard material being used by the contractor, but nobody paid attention towards the issue raised by us at that time. And now the result is before us”, said Gogi, a resident of the Bagh Kheta Ram locality. “The labourers hired by the contractor for fixing interlocking tiles neither levelled the place before fixing the tiles nor they used the required amount of cement as a result of which the newly fixed interlocking tiles have started dislocating”, said Jeevan Kumar, another resident. This locality falls under the ward represented by municipal council president Baldev Krishan Dhir himself. “We had even informed MC president about use of substandard material, but to no avail”, he added. Earlier too, the interlocking tiles fixed at the College Road, Lajpat Rai Road, Shastri Nagar, Geeta Colony and some other areas had got dislocated a few days after they were fixed. The culture of “spare the rod” is giving a tough time to teachers in both government as well as private schools in the city, as they are finding it hard to discipline their classes. “Don’t-touch-my-child” attitude of parents has become a pain in the neck for most of them. This has also resulted in a growing tendency among students to take their teachers lightly. “If we say harsh words to discipline our students, next day we get to hear that a complaint has been lodged with the principal against us,” a teacher said. “These days, curriculum can be uploaded from Internet. Teachers are playing the role of mentors with the advent of CCE. If a student respects you, there are chances of he learning something from you. You command respect if you are in authoritative position,” says Rohit, who teaches English in a city school. “I was caned by my English teacher once for not doing my homework. I never missed the work assigned by him after that. He eventually became my favourite teacher. I thank him for taking disciplinary action because the command that I enjoy over my subject is only because of him,” says Kuljit Singh (42), who runs an English coaching institute in the city. People in the United Kingdom are waking up to the fact that “spare-the-rod” attitude can lead to indiscipline among children. But, locals are view that their children might go astray,” says Naina Talwar, another teacher from a private school. “It is difficult to control the children as they tend to misbehave and create ruckus during the classes. But they know that teachers can’t touch them and would get promoted to the next class even if they don’t perform well,” says Anjum Khanuja, a science teacher. “Fear and respect go hand-in-hand to an extent. A bit of awe about a person goes a long way taking what a person says seriously,” says a city-based psychologist. “The teacher has to be given some power. We shouldn’t be allowed to use the stick, but show it at least,” says Khanuja. Rescheduling of the winter break in a few private schools since 2010 has been spoiling the vacation of a large number of families in the city. For Rohan Garg, who studies in a private school, winter vacation is special as he along with his parents jet off to holiday destinations every year. This year too, his parents decided to go to Shimla, but rescheduling of the vacation dashed it all. Disheartened, Rohan is left with no choice other than going to school, which close for a few days in January. “I have very fond memories of every winter vacation. My mother and father are on holiday even after Christmas, but I no longer have,” he complained. His father PP Garg said: “People are in mood to escape from the hustle and bustle of city during holidays. I had to cancel the holiday package. I had booked a hotel in advance for the family. I don’t understand the reason behind rescheduling of the holidays.” As offices of most of the working couples remain close from Christmas till first day of New Year rescheduling of the vacation by the schools have frustrated them. A principal of the private school said, “The chill hasn’t set in. It is really cold and foggy in January. The administration has directed school heads to declare holidays in January. We rescheduled our holidays so that we could get more working days to complete the syllabus.” Another principal said the vacation was rescheduled keeping in view the late arrival of winter. “Though it is cold now, but we can’t change the dates again and again,” she added. Though the city police has put up various signboards on various busy roads and chowks, asking residents not to give alms to beggars, the practice continues due to "encouragement" by residents. Be it city interiors, public places, malls or chowks, the moment you are there, you are surrounded by a crowd of beggars. Certain NGOs, city police, local administration and priests at temples have been appealing to residents not to give cash or other materials to able-bodied persons. But all such appeals go unheeded. “At Dandi Swami Chowk, they roam about the roads, creating a nuisance to devotees. There are about 70-80 beggars for whom the dividers on the entire Dandi Swami road are permanent shelters. They stay here for 24 hours. And to beat the extreme weather conditions, they just hook on to various kinds of drugs," said a priest at the Dandi Swami temple. He further added that they were controlled by a particular "mafia". Some children who are seen at some point today, are found begging in other parts of the city. "And if you observe them minutely, their wounds and bandages on the body keep on changing from arms to legs to head to face. It is unfortunate that for getting money, the mafia is using small kids," said the priest. A devotee, Neha Mittal, outside the Durga Mata temple, Jagraon Bridge, said she made sure that she provided cash or kind to the "deserving" only. "But if we do not give them money, they will not let us pass the stretch. It becomes too embarrassing for devotees like us to argue with them on the roads. Young girls and boys, who look physically perfect and can earn their livelihood, too, demand alms from devotees," said Neha. A traffic cop at Bhai Bala Chowk said over the years, the population of beggars had increased. "Ludhiana is a rich people’s city, who do not mind providing Rs 5 or Rs 10 to the poor, but those who have a good physique, should be avoided by them. At the end of the day, these beggars are able to collect up to Rs 400-500 in alms. If someone is physically challenged or too old to earn, he or she should be helped, but not youngsters," said the cop, adding that they were provided with blankets and quilts by some elites, which they sell the next day to get their daily dose of drugs. During winter, the most difficult task is to get out of bed and fetch papers from doorsteps. I felt that the chill would pierce my skin. While reading news, I thought of papers vendors, who leave their houses in the wee hours. They brave the chill and ensure that newspapers reach our doorstep on time. Yes, like us they too are doing the job for money, but it takes courage to be out on the road in this weather. But, my comments are not meant to indicate that the vendors could relax and forget to drop papers in my home. Officials of the civic body and other urban development agencies like PUDA, GLADA and the Improvement Trust, it seems, are desperately waiting for the code of conduct for assembly elections to take effect. The other day, this reporter received a call from an official who wanted to know as to when the code of conduct is expected to come into force. On being asked as to why was he so keen to know about it, the official quipped, “Jaldi code lavao, tan hi asin kujh saukhe hovange.” What he probably meant was once the poll code comes into force, their political masters will not be able force them to arrange for laying foundation stones of the projects which had no chance of seeing the light of the day even in the distant future. The Christmas celebrations have gripped the city. It is not only the kids, who looked excited but the elders, too, were seen greeting each other “Merry Christmas”. The city gave a festive look with Santa Claus caps, bells, hangings and Christmas trees decorated in markets, shopping complexes, malls and beauty parlors. Children were seen enjoying the festival in groups. Parties were organised at farmhouses and restaurants. An old couple basking under the sun said, “It is good to see youngsters enjoying all festivals. It may not be in our culture, still if enjoyment is in limits, we must not discourage our children”. Looking at a poster pasted outside a religious organisation turned out to be amusing satire. The poster had the headline “Good News”. There were prizes for drug abuse and using intoxicants. The fist prize was awards of slaps and hits by family members. The second prize was ousting from home. The third holes and damage to lungs and it went on. An onlooker said satires; posters like these are essential for making people aware and awaken them against social evils. When Deputy CM Sukhbir Singh Badal was in city to inaugurate some development projects on December 17, he had decided to address a press conference at the helipad in Punjab Agricultural University itself. When the deputy CM’s chopper landed at the helipad, it was a visual delight for many mediapersons, who had never seen a chopper from so close. Many of them brought out their mobile phones and started filming the chopper landing. A senior journalist later uploaded the picture on his Facebook account and has been receiving comments for the same. English is of course a foreign language for a few. One such incident took place at a city hospital. An orthopedic was busy checking patients. He asked a patient, “Why don’t you take care of your feet, look how bad these have become.” The patient replied, “Actually a few years ago I met with an accident and a few steel rods were ‘installed’ in my legs. Due to this I can neither bow nor clean my feet properly. So the ‘maintenance’ part is of course poor. But suggest me some oral medicine.” All staff, present there, could not resist laughing. The ongoing work for the repair of the massive damage caused to 100 feet and 80 feet wide roads in the 475 acre residential scheme of Shaheed Bhagat Singh Nagar on Pakhowal Road here, developed by the Ludhiana Improvement Trust (LIT), is moving at a snail's pace. The work of earth-filling and laying stone metal, which was stipulated to be completed in 15 days, is still nowhere near half completion even after four months. According to information obtained under the RTI Act by Arvind Sharma, an RTI activist, the LIT authorities had awarded the work of earth-filling, compaction and laying stone metal on the main roads around blocks E, F and G in Shaheed Bhagat Singh Nagar, which were heavily damaged (with big craters) during the monsoon season, to IHR Associates. The work awarded in the last week of August this year, had to be completed in 15 days at an estimated cost of Rs 75 lakh. However, even after four months of the work having been awarded to the construction agency, the repair work was nowhere near completion. Barring a couple of short stretches of the damaged road length, earth-filling and compaction on the 100 feet wide road near the City Centre was not finished. The information provided by the LIT authorities under the RTI Act revealed that a part payment of around Rs 23 lakh had also been made to the agency for the work done till now. Admitting that the pace of the work was slow, and the work of earth-filling and compaction was yet to be completed before stone metal on the roads could be laid, LIT Superintending engineer SS Jakhar told The Tribune that the period for completion of the work (15 days) was unrealistic and such a short time was given to the construction agency to stress the urgency of the work. "As earth-filling was being carried out, a main sewer line had broken, which took a very long time while repairing and replacement. With the overflow of sewer water, the earth filled on the stretch of the road had washed away, and the work had to be started from the scratch once again," he said while expressing confidence that in the next 15-20 days, the work of earth-filling and laying stone metal should be completed. The premix carpet on these particular roads would be laid later as the weather conditions are not conducive for that work right now, Jakhar added. The audience in the packed auditorium was uttering "wah-wah" to poets while some of them appreciated the poets' ingenious verses by looking silently at one other. The mood in the packed auditorium had turned delightfully deliberative as they savoured each word spoken and enjoyed the subtleties of meaning as the All India Mushaira went on. Organised by the Sufi Foundation India, the "Mushaira" saw the participation veteran actor Kader Khan and noted names in Urdu poetry including Munawwar Rana from Lucknow, Anwar Jalapuri, Iqbal Ashar from Delhi, Javed Arshi from Indore, Khushbir Singh Shaad from Jalandhar, Dr Liaqat Zafri from Jammu and the poets from the city including Sardar Pancchi, Ritaz Maini and the DIG police Faiyyaz Farooqui apart from other poets from other places. They captured various emotions, the state of society and human psyche in through their poetry, including parental love, god and politics. About 16 poets sat on the stage with pictures of Urdu legends like Kaifi Azmi, Faiz Ahmed Faiz, Sahir Ludhianvi. The DIG police, MF Farooqui, surprised many in the audience with the earnestness of his poetry as he spoke with enthused voice, lavish smiles and smooth diction, clarity and poetic abandon. Opening couplet had the appreciation of parents with "Paude apne mali ka paseena yad rakhte hai". Another poet, Gulrez Ilahabadi, recited against the practice of female foeticide giving emotion to female voice "Yu na jalao, yu na gado yu na humko kokh mei maro, avtaron ki janni hai hum". Other poets capturing on pain of partition and addressing Hindustan mein. Munnawar Rana got standing ovation from the audience. The national capital seems to be the new address for various congress leaders eyeing on the party tickets from Jagraon (reserve) and Mullanpur Dakha Assembly Constituencies for the coming assembly elections in the state, which are slated to be held on January 30, 2012. Sources said a large number of congress ticket aspirants from Jagraon (reserve) as well as Mullanpur Dakha Assembly Constituencies have been camping in New Delhi for past couple of days. On the one side where former ADC Shiv Ram Kaler and Manpreet Singh Ayali have already started campaigning in their respective constituencies a couple of days ago from Jagraon (reserve) and Mullanpur Dakha assembly constituencies, respectively, the congressmen aspiring party ticket from Jagraon and Mullanpur Dakha constituencies, on the other hand, they have been camping in New Delhi for the past some days to impress upon the party high command to award ticket to them. It is pertinent to mention here that there have been more than 15 congress leaders who have been aspiring party ticket from Jagraon assembly constituency for the coming assembly elections. The prominent congress leaders who have been eyeing party ticket from Jagraon, including Koom Kalan, MLA, Isher Singh Meharban, former ADC Ajmer Singh Siwia, Jagdarshan Kaur, Manpreet Kaur Dhaliwal, Rajeshinder Sidhu, Rattan Singh Kamalpuri. From Mullanpur Dakha constituency, the prominent congress ticket aspirants include Qila Raipur MLA Jassi Khangura and Jagraon MLA Gurdeep Singh Bhaini. Sources said, a majority of the congress ticket aspirants have made the All India Congress Committee (AICC) office in New Delhi. High drama was witnessed at the Haibowal Dairy complex when a woman along with her two children allegedly staged a dharna against her father- in- law and husband for throwing her out of the house. Sunder Das Dhamija, president, Govind Godham, is the father- in- law of the woman identified as Ritu. The woman alleged that she has a matrimonial dispute with Sunder Das Dhamija’s son Deepak. “The matter was taken up by the woman cell. She started living separately following a compromise that Dhamija will take care of her monthly expenses,” said Ritu. “Dhamija refused to bear the expenses after the money for two months. I don’t have any financial resources. My kids are small. Money is needed for educating them,” said Ritu, while raising slogans against her father- in - law. Sunder Das Dhamija, however, rubbished the allegations as baseless and said Ritu and her relatives hitched the conspiracy to defame him. Seven youngsters have come together for doing social work and spotting hidden talents in the city. All of them come from different backgrounds and work once a week for different causes. “I wanted to serve society. When I came to know about this organisation, I started working with them and then came across like-minded people who wanted to improve society,” Sakhsham Katyal said. The group organised a rock show for a school by inviting a few amateur rock bands from the city. They sold passes and the money they got from it was used for running the show and for the school. Amateur rock bands “The Blax”, “Metal Mordar” and “Retribution” took part in the show. The show was a big hit as local Rock bands are popular among the youngsters. Maple Bear Canadian Play way and Nursery School, Udham Singh Nagar, Ludhiana, organised Healthy Baby Contest-2011 on the day of Christmas. Little babies were selected in the category up to 5 years by a panel of judges. The star attraction was the announcement of Mr Ludhiana Little Champ Garvit Kapoor and Miss Ludhiana Little Champ Vitasta Bhat. A drawing and painting competitions were also organised. Christmas fete was also organised in which lots of attractions like different games for the kids and parents were organised like ring game, hit the glasses, photo shoot and hit the bells etc. The NSS volunteers on the fourth day of an NSS camp started with the yoga and pranayama. The volunteers were also given information about some medicinal plants in Ayurveda and their uses in treating common problems. The briefing was followed by an extension lecture on “Life Style Disorders” by Dr Vipan Gupta, Lord Mahavira Homeopathic College and Hospital, Ludhiana. Dr Gupta stressed on the problems due to our poor life style and gave certain remedies to ensure good health. When the city people were busy in celebrating Christmas by holding parties and exchanging gifts, two NGOs decided to celebrate the festival with a difference by serving the sick and ailing animals. The Hope Animal Welfare and Sachi Sewa Animal Welfare Society, both Non Government Organisations, served sick cows with green fodder and snacks and milk to dogs. Poonam Kalra, founder of Hope Animal Welfare, along with some other members visited the ashram being run by the Sachi Sewa Animal Welfare Society at Tajpur village. Swami Khushi who runs Sachi Sewa Animal Welfare Society said, "We had eight cows in the ashram, out of which two died and now we have six sick cows with us and 28 sick dogs. Today, with the help of the NGO, we served fresh eatables to the animals. We also cut a Christmas cake for the children who belong to labour class families. During the last Christmas, we received a van for lifting away the sick animals. This Christmas, we have arranged a small get together." Ludhiana MP and the national spokesperson of the Indian National Congress, Manish Tewari, today exhorted upon people to follow the teachings of Jesus Christ. Addressing a Christmas function at a church on the Brown Road, Tewari pointed out, Jesus Christ had sacrificed himself for the deliverance of the whole mankind. Drawing the attention of the people to the fact that all the religions preached unity and brotherhood he regretted that some vested interests were trying to divide people along the religious lines. The MP pointed out, it is the message which the Jesus conveyed through his sacrifice which survived all the crucifixions of the time. The message of truth and peace survives against all odds as we can see even after two thousand years of Jesus’ crucifixion. Prominent among those present on the occasion include, former minister Surinder Dawar, DCC urban president Pawan Dewan, Sanjay Talwar, councillor, Ashok Bagga, Kailash Kapoor, Rajan Kapoor, Father Darbara Singh, Samsung Dogar, Emrin Gill, Kainath Gill, Nobel Bedi, Jaikav and William Jairis. The Punjab College of Technical Education (PCTE) celebrated Christmas. After a month of cake mixing ceremony, the students prepared plum, fruit and chocolate cake. A Christmas cake was cut to mark the occasion. A student dressed as Santa Claus distributed the sweets and gifts and the other students. Some students of the college were at the gaddi tribal Gamru village, to celebrate the festival with the tribal children. Dr KNS Kang, director of the college said, "They wanted the students to imbibe qualities that would foster academic brilliance, physical development, spiritual well being and social responsibility." A Christmas carnival was organised by Guru Nanak Public School (GNPS), Sarabha Nagar, on its GNPS Birmi (near South City) campus. The carnival was inaugurated by president GNPS Managing Committee Jasbir Singh and general secretary of the committee. The carnival began with school jazz band singing Christmas songs like. Around 5000 parents and students visited and enjoyed thoroughly during the carnival. A migrant who was running a tea stall on the Ludhiana- Chandigarh road near the Kapila filling station was murdered by two motorcycle borne persons with sharp-edged weapons on Thursday night. The migrant, identified as Shree Lal, was from Uttar Pradesh. He was residing at Kapila Colony for the past several years. In a statement recoded with the police, Bansi Lal, brother of the deceased, stated that Shree Lal had gone to market for some work. He saw two persons attacking him with sharp-edged weapons. The attackers fled on a motorcycle after he raised an alarm. Shree Lal had sustained serious injuries. He was rushed to the local civil hospital. The doctors referred him to the DMCH, Ludhiana. He died on his way to the hospital. Samrala DSP, Tejvir Singh, said a case was registered in this regard and police parties were raiding hideouts to nab the alleged attackers. Nangal Khurad Football Team emerged winners, while the Bhogiwal Sports Club finished as runners-up in the sixth Rajiv-Sanjiv Memorial Football Tournament organised by the RS Friends Sports Club at MGMN Senior Secondary School here today. Davinder Singh was declared the best player of the tournament. The three-day tournament was earlier inaugurated by Anil Aggarwal, chief executive director of the Shryans Group of Industries. Former SSP SS Brar, Dr Sunit Hind, and Harjinder Singh Nathumajra, president, Block Congress Committee, presided over various sessions on different days. Bimal Sharma, Dilshad and Bhag Singh Bhagga councilors gave away prizes to the winning team and outstanding players. The organisers also distributed woollens among 300 poor students of local schools.